SIGN UP or TRY 1 MONTH FREE! Start a global conference call with up to 50 people from anywhere in the world without any prior reservations or time of day restrictions. Get the best conference call service to service your small business conference calls, anytime of the day, 7 days/week. 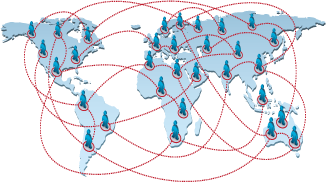 Connect anyone from virtually anywhere worldwide through a variety of connection methods. We can dial out to your participants or they can dial into any of local conference call access numbers in over 40 countries. Enjoy crystal clear conference calls through our state-of-the-art conference network infrastructure. Reservationless conference calls FROM anywhere TO anywhere. Connect global participants to a audio conference call in seconds. Excellent call quality and secure network infrastructure. Multiple methods; Local & Toll-Free Dial In Access, and Web Dial Out. On demand, fully automated conference calls 24 hours/day, 7 days/week. Unlike others, our conference service is always available. Never get a busy signal. Use any phone such as offices, cell phones, pay phones, and more. If guests arrive into the conference before the moderator starts it, they can wait in the waiting room. You can now record and download an MP3 file of your conference, all for free! A convenient way to ensure you always have minutes. It's Prepaid! So no contracts, or long term commitments to sign. No more bills sent in the mail. Reduce costs by 90% over traditional methods of conference calling. No Setup Fees, No Installation Costs, Speedy Activation. No connection fees, No Hidden Fees, No Gimmicks, guaranteed. No cancellation fees and No deactivation fees. One Rate, 24/7, No time or day restrictions. Lower than AT&T, Sprint, international VOIP, and collect calls. Get 24/7 online access to view your call and billing history. Free moderator web controls. Includes mute, phonebooks, call logs, and more. Activate commands such as mute all, dial out, from your phone. Create unlimited sub-accounts and manage from a single login. Comprehensive online help resources available. Fully redundant, robust fiber optic Digital Network. © Copyright 2004, 2019 by Universal Calling. All Rights Reserved.